LD has a great freebie for everyone but first, have you seen their new Squawk Box? 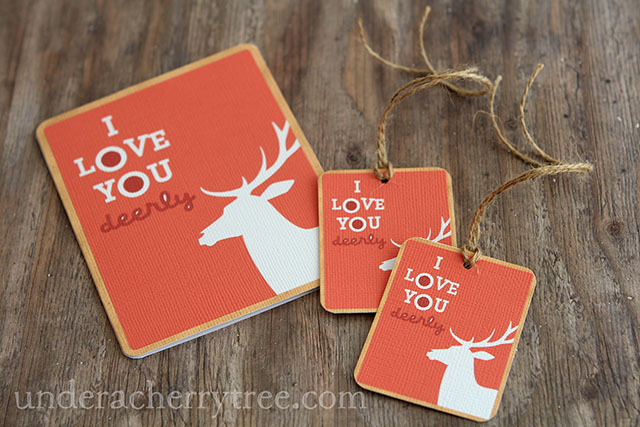 I *heart* it! Don't forget to use their new 50% off coupon! 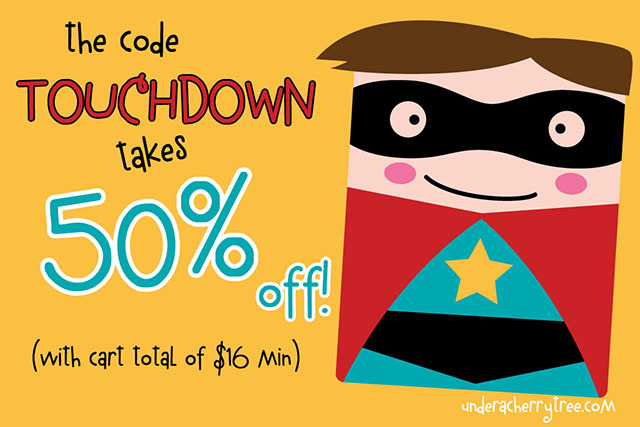 If you have at least $16 worth of files in your shopping cart, just enter the code TOUCHDOWN at checkout and it will take 50% off! That's a really good deal! 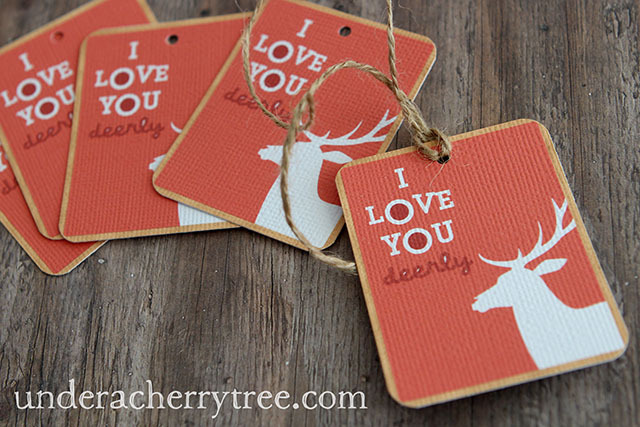 Click HERE to take advantage of the discount before the code expires on Feb 5. Click HERE or the image above to go to the LD site. Add the Thermometer Candy Holder graphics set and Cut Its (SVG included) to your cart and checkout. You pay $0.00! The link to the downloads will show up after the "transaction" is completed. HOT! New 50% off LD coupon! Woot woot! 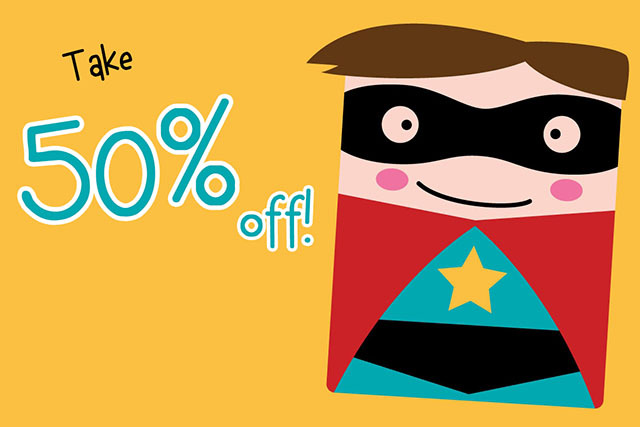 There is an awesome coupon out that takes 50% off on the LD site! Just enter the code Touchdown at checkout and when your cart has a minimum of $16 worth of product. The coupon will expire on Feb 5. Click HERE to go to LD and use the coupon now. To get any or all of them, just click HERE. The current latest version of Silhouette Studio is v3.3.451 (released 1/22/2015). If you need it, you can download it from THIS LINK. 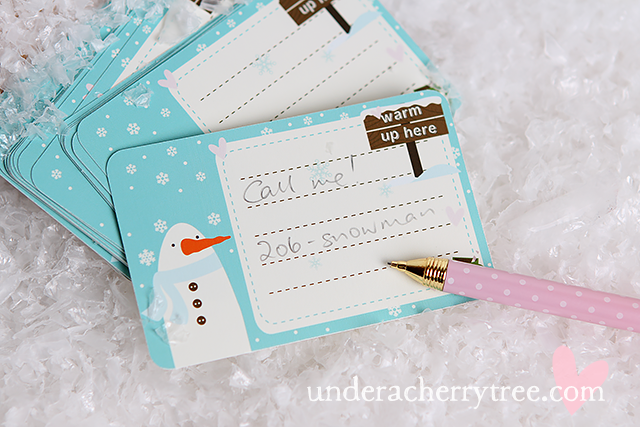 Mini notecards are great for anything- as a tag, a playdate card, a lunch note, or just for writing down a thought. My favorite thing is that I can make a lot of them very quickly. 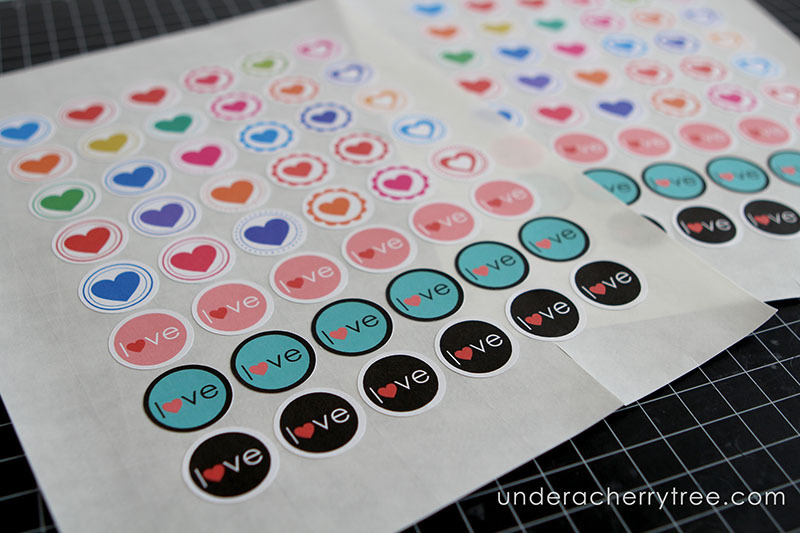 Just print-and-cut! 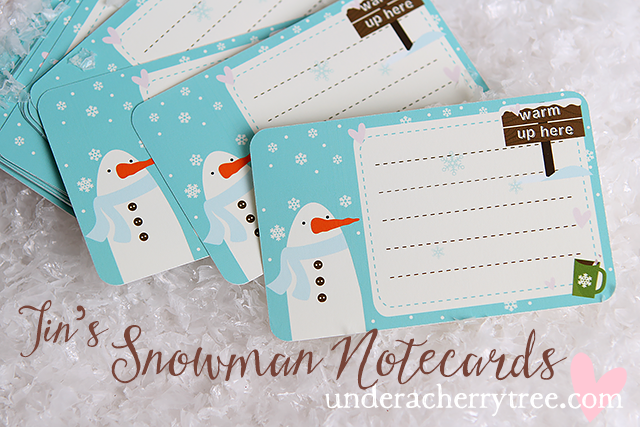 Each card is the size of a credit card (or 3.375" x 2.125"). 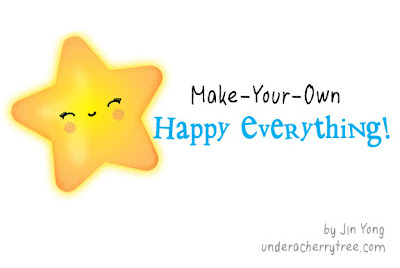 If you want to try making your own, just follow the steps illustrated in the picture above. 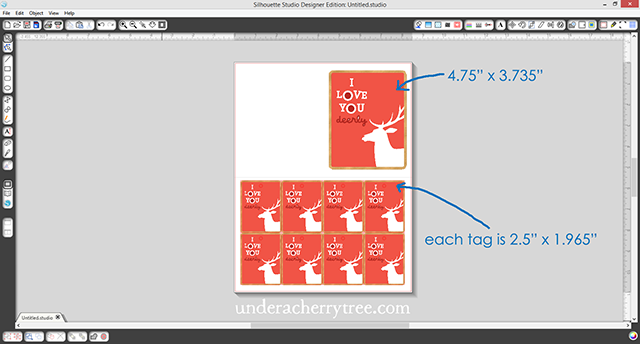 Once you have finished designing the card, just fill the paper with the design before sending it for print-and-cut. 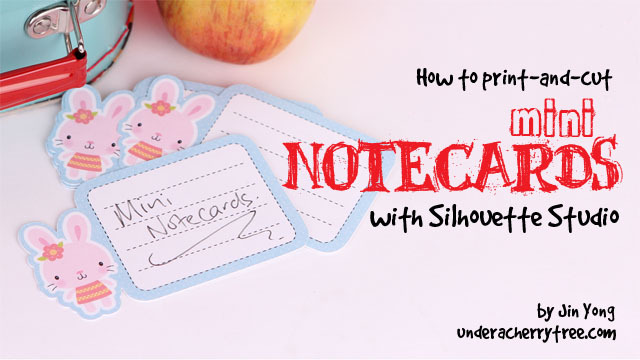 Up to 8 notecards can fit onto one letter-size sheet of cardstock. Did y'all see LD's latest release? Hilarious! Who knew they'd come up with something so naughty?! I couldn't stop chuckling after I saw what they had done. While a large portion of LD's Valentine Schmalentine is rather raunchy, there are a couple of designs that are pretty mild. Like the one that I used for today's project. 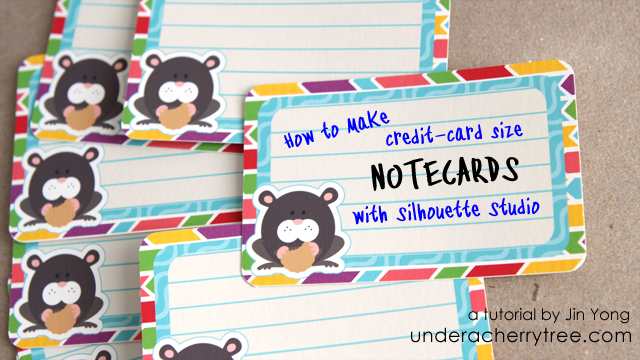 I had originally intended to print-and-cut the tags and card but I ended up cutting them with my paper trimmer as it was simply faster. There was also less paper wastage since I did not need to leave any space for the registration marks. 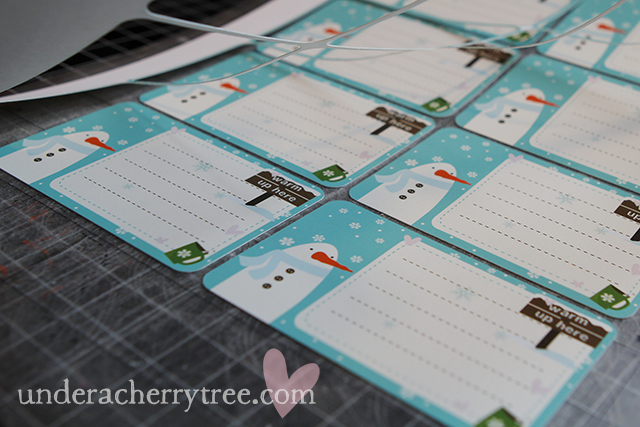 I rounded the corners with my Corner Chomper and punched the holes for the tags with my Crop-A-Dile Big Bite. I loved that I could punch out all eight holes at once! 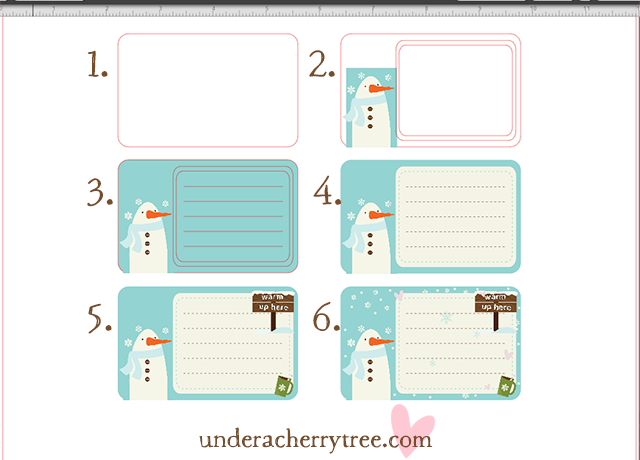 If you have not grabbed your Square Box Cut It (SVG), click HERE to get it now before the freebie expires tonight. 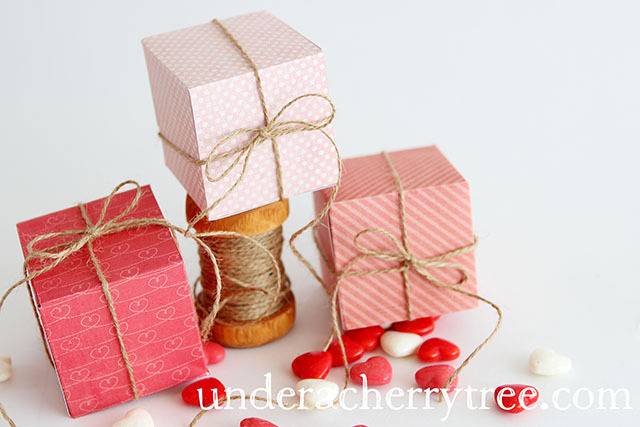 Also, scrapNfonts posted their freebie after I had made my Friday Freebie post but I see that it is up now. 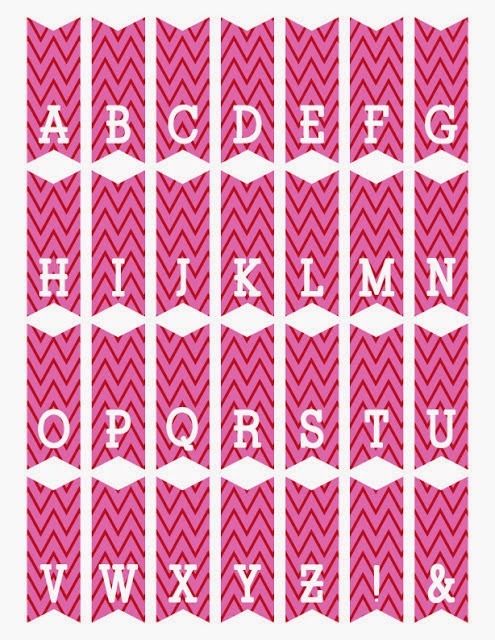 The free Mini Alphabet Bunting printable is available until Jan 30. To get it, just click HERE. 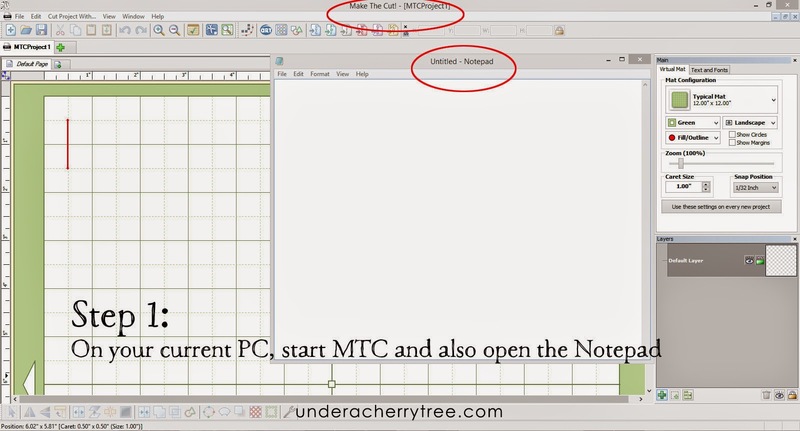 How to Recover your MTC Registration Code from your computer. Yes! The kids are finally in bed! I've been waiting all day to set up my new laptop. My current machine is on it's last leg and I feel ridiculous smacking the monitor every time the colors on the screen turn weird. I've been testing Make-the-Cut (MTC) on my new laptop for a few days now but I didn't register the software as I wasn't sure if I was going to keep the computer. I've come to like it a lot (It's sooo preeetty. :D :D ) and I'm finally ready to move on. But first, I need to register MTC. I bought MTC when it was first released way back in late 2009 and I've long lost my registration code. The good thing is that it is super easy to retrieve it. Just go to the MTC website and put in a request and the code will be sent within an hour. "No code? No problem! ", I happily said to myself as I prepare to go online. 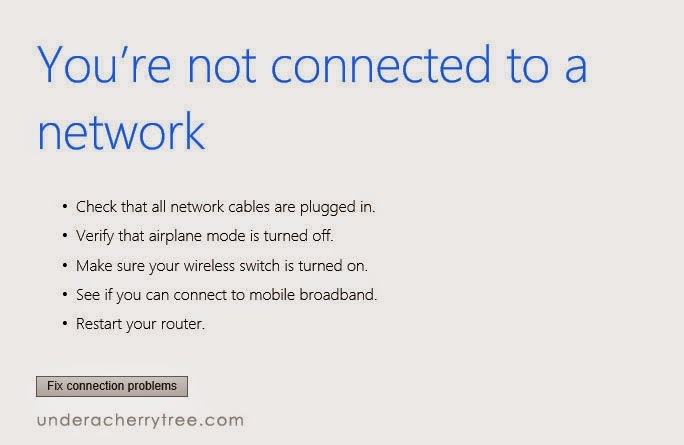 "You are not connected to a network?" WHAT?! SERIOUSLY?! I cannot believe it! It's windy and stormy outside and my internet has gone down in bad weather before but...but....WHY DOES THIS ALWAYS HAPPEN TO ME?! I ran whining to Hubby as if he can somehow use his magical unicorn powers to summon the internet but it was no use. The internet connection was gone and I don't know when it'll be back. I was feeling really disappointed. I can hardly get anything done when the kids are home and now that I can't send a request for the key code, I'll have to wait until the long weekend was over before I can finish setting up my new laptop. I was so bummed! Just when I was about to give up, something wonderful happened. It was almost like the Internet Gods took pity on me and sprinkled their magical internet dust on my poor tired head. I was about to shut down my laptop when the cobwebs in my head parted and I suddenly remembered something that I had read about a loooooong time ago. The instructions below will show you exactly what I did and how I retrieved the key code without requesting it from the MTC website. 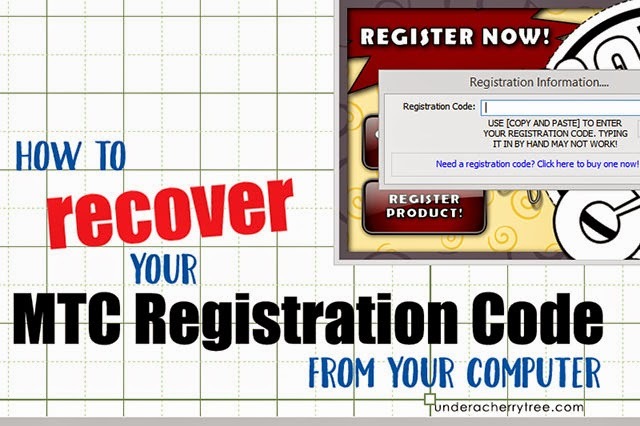 Note that I ended up un-registering the copy of MTC that I already had on my old-and-about-to-be-replaced computer but if I want to, I can always re-register it again with my once-lost-but-now-found-again registration code. 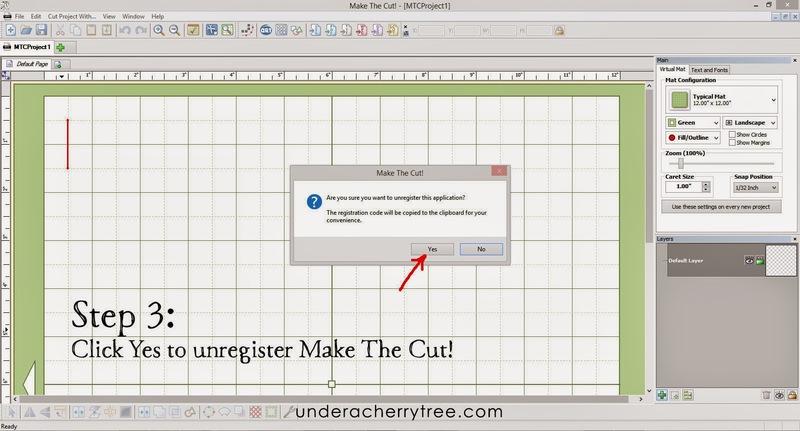 Step 2: Select Help>Advanced>Unregister Make the Cut! 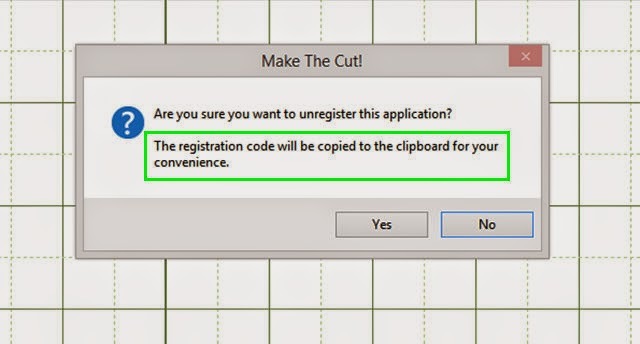 Step 3: When you click YES to unregister MTC, the registration code is copied onto your clipboard. 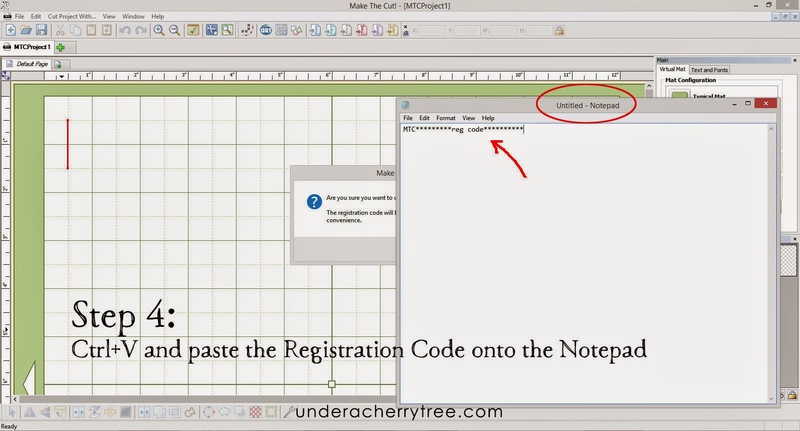 Step 4: To recover the registration code, just go to your Notepad and hit Ctrl+V to paste it down. Whoa. 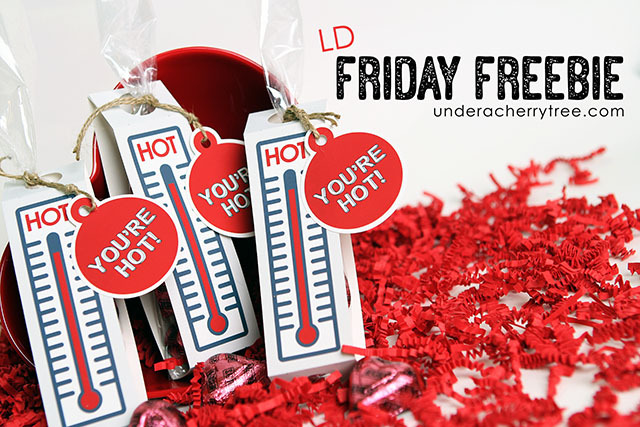 Today's new LD collection comes with an Adult Content Warning. Wish I would have seen it before I looked at the cards and spit out my coffee. Hehe...somebody at LD must be in a naughty mood to come up with these. 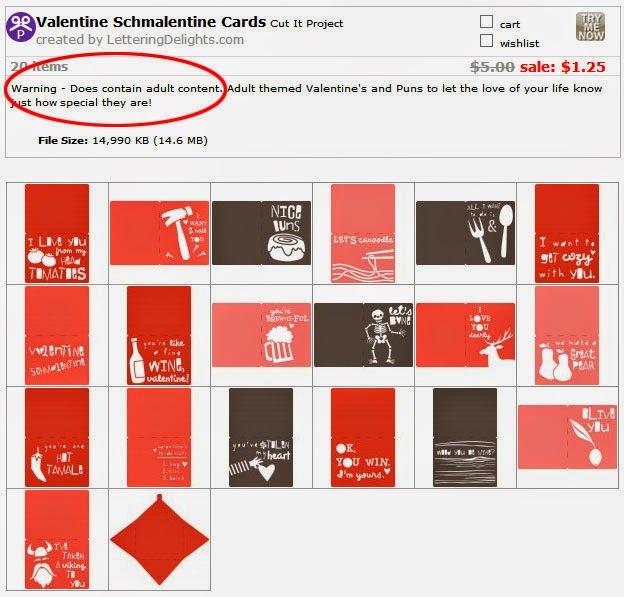 Hubby is going to be so glad to know that he's not getting another kiddie Valentine's Day card from me this year. HA! LD's "Head-Over-Heels Dollar Days" sale is still going on. 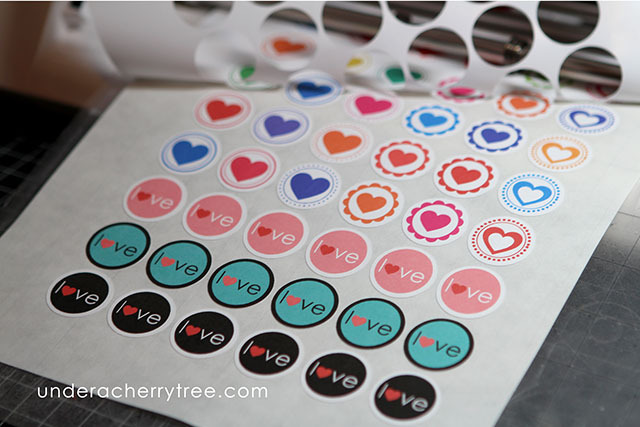 All Love-themed Cut Its are $1.00-$1.25 (reg. $4-$5) while Graphics and Alphabets are only $1! 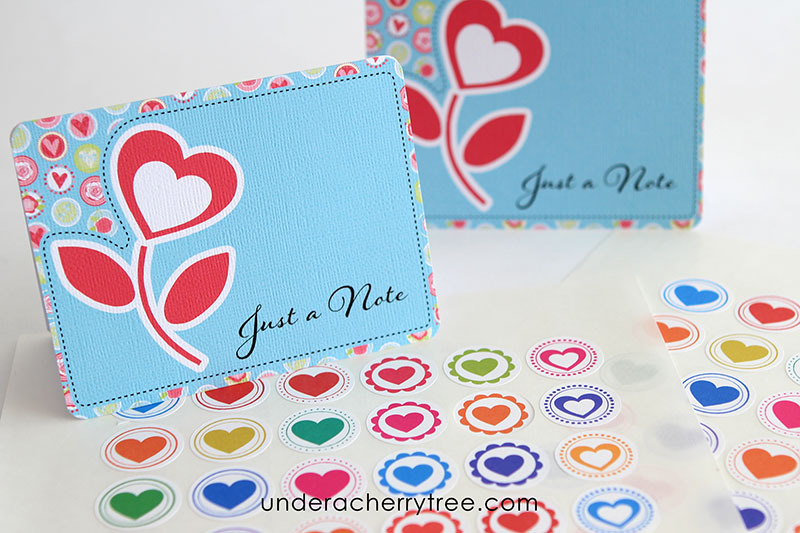 Love-themed Paper Packs are only 50 cents! Here are a few examples of what's on sale, there are plenty more on the LD site. Click HERE to shop the sale. The snowmuchlove code is still working. Enter the coupon during checkout and take an additional 30% off (min $14 cart). Click HERE to shop the sale. Click HERE or the image above to go to the LD site. Add the Square Box Cut It (SVG) to your cart and checkout. You pay $0.00! The link to the download will show up after the "transaction" is completed. Jan's post on my Facebook page. Thanks, Jan! 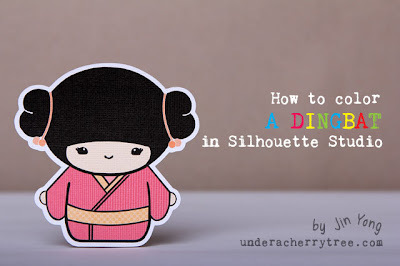 If your Silhouette cutting machine has been making stray cuts, you can use Jan's tip above to fix it, or you can just click HERE to get the latest update (v3.3.451) from Silhouette America. 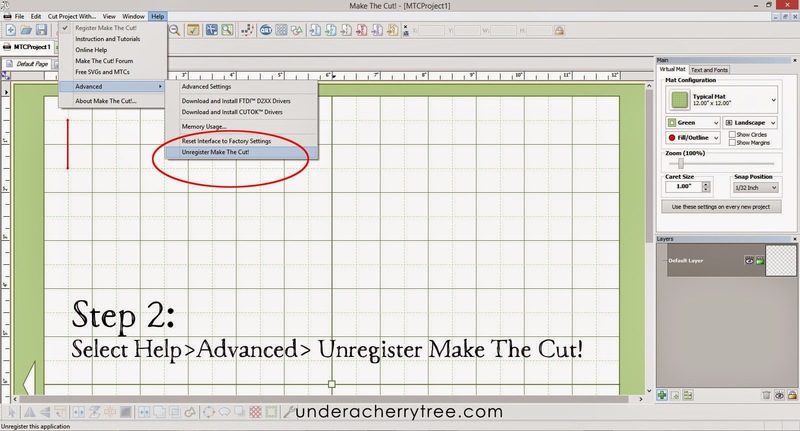 If you are tired of playing Beta-Tester and would rather just revert back to the Legacy version, click HERE to see how you can uninstall v3 and re-install v2. p.s. Sorry about the long title. Can you tell I've been reading this book and Alexander is still on my mind? 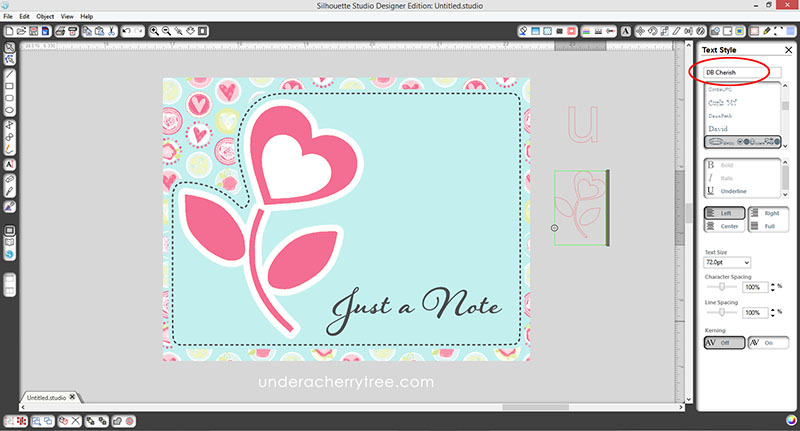 I mostly use SVGs for my cards and it is easy to forget that many dingbats work with Silhouette Studio too. 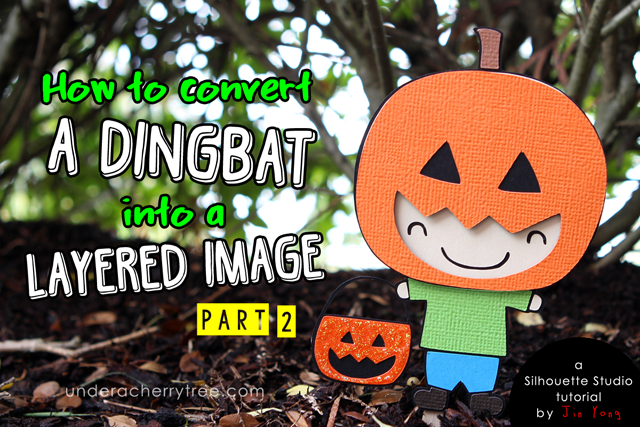 To use dingbats with the program, just treat it as though it is a font - install it on your computer and use the Text Tool to bring the image onto the Silhouette Studio virtual mat. You do not need the Designer Edition to do this because it is not an SVG. You also do not need to trace the image because unlike a graphic, it already has cutting lines. 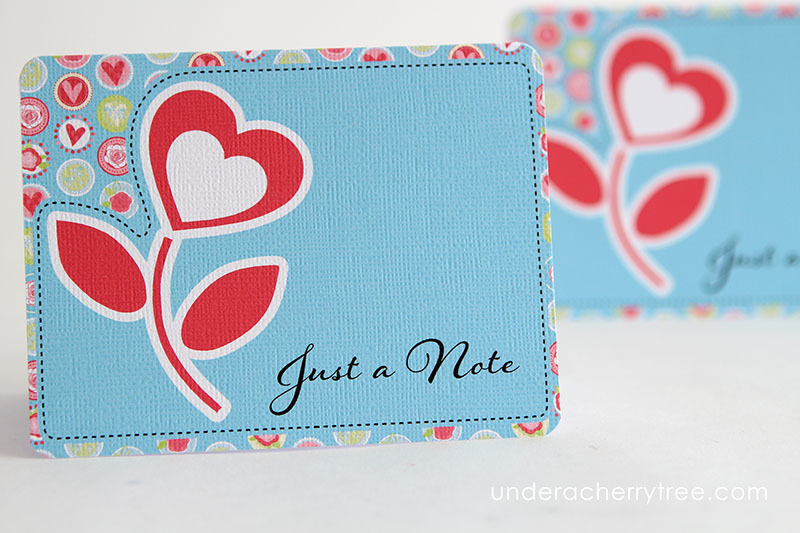 Today's cards and stickers were made with LD's DB Cherish doodlebat font. 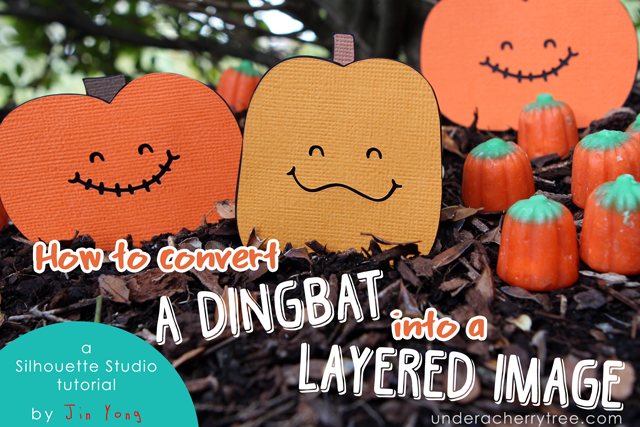 ("Doodlebats" are LD's line of dingbats.) 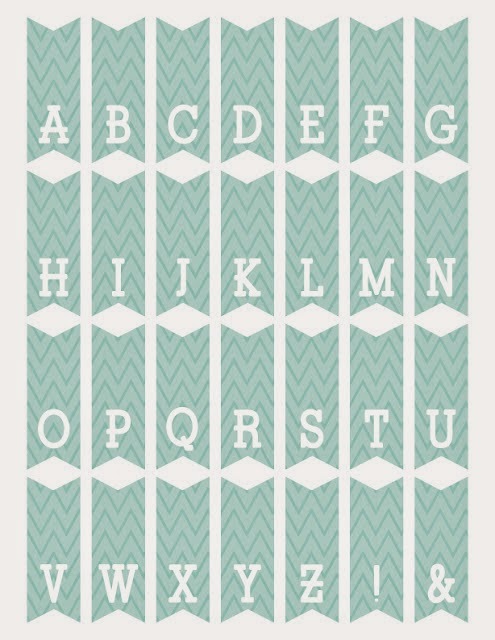 The file is one of 10 fonts and doodlebats that LD is giving away for free this week. Click HERE to get yours before it goes back to full price after Friday. 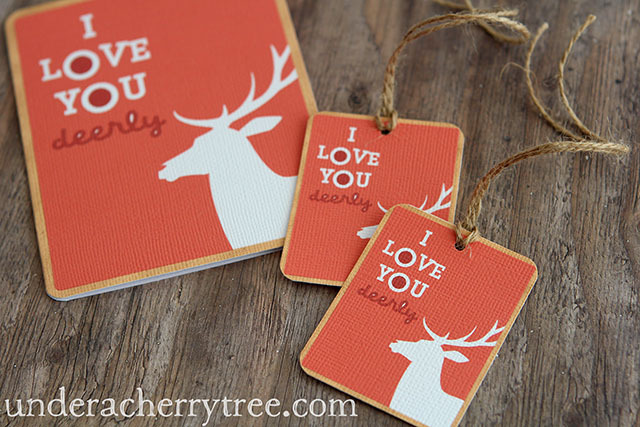 70+ Valentine's Day projects plus a great sale!